Mark Ruffalo and the Russo Brothers did some expert level trolling on Friday, teasing Marvel Cinematic Universe devotees about a possible Avengers 4 title reveal. Ruffalo has been known to spoil some pretty important secrets from the MCU. Last year, he ruined the ending of Infinity War during an interview and before that, he accidentally left his social media live stream on during the Thor: Ragnarok premiere, letting fans listen to nearly the first half hour of the movie before turning it off. 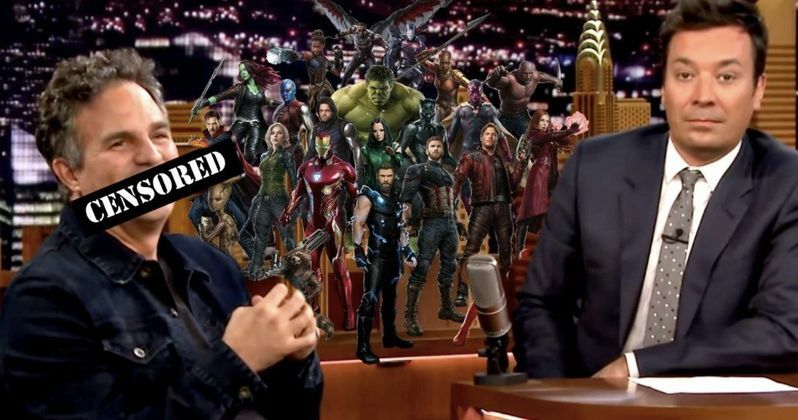 After a long absence on social media, Mark Ruffalo made a small return at the beginning of the month and then publicly asked Jimmy Fallon to edit his pre-taped segment on The Tonight Show yesterday. This obviously led to MCU fans going crazy on social media, wondering what Ruffalo spoiled this time around. The Russo Brothers even got in on the fun to tell the Hulk actor that he had been fired for leaking another detail about the MCU. However, when it came time to make the big reveal, Ruffalo's words were bleeped out of the broadcast and even for the live audience who was in attendance. Mark Ruffalo started October by returning to social media and it appears that his tweets yesterday were to promote getting people out to vote for the upcoming midterm elections. Ruffalo is big on politics and used the potential leak of the Avengers 4 title to get people involved with politics, and the Russo Brothers helped out his cause. The actor has shown up at many anti-Donald Trump rallies over the past two years and is encouraging the public to vote. For now, MCU fans will have to go back to theorizing what the Avengers 4 title really is. So far, the best guess has been Eternity War, but that has yet to be officially confirmed by Marvel Studios at this time. The Captain Marvel trailer just dropped, which means that we're still probably a few weeks away from learning the real title of the movie. It's believed that fans will get the official title and a teaser trailer before the end of the year, which isn't too much of a stretch. We'll all have to sit back and wait to see what Marvel Studios plans to do. You can check out Mark Ruffalo's Twitter account for more information on his expert trolling.